The end of 2017 is near and it could be known for many things. The author, Frank Bures, says, “The idea that 2016 was the worst year ever started circulating after several celebrity deaths (Prince, David Bowie, Leonard Cohen) were followed by an election that did not go the way many people wanted it to. After that, the worst – year – ever meme became unstoppable, and in 2017, the drumbeat of decline has not stopped. “Offhand, I can think of a lot of things that are worse than a cold winter day: the 2004 Indian Ocean tsunami, the 1929 stock market crash, the Bataan Death March. But it’s true that things do feel worse than they actually are. Part of the reason lies in the 24 – hour news cycle and it’s never – ending flow of bad news. “Contrary to what you might think, violence is at all – time lows, as is the rate of global poverty. War deaths are fewer than ever in history. On most indicators where you might think progress is not being made, the opposite is probably true. “Likewise, Steven Pinker said stated in his book that the world is not more violent, more racist, more genocidal, or more unjust than in the past. He documented long – term declines in homicides, as well as massive gains in education, health, and wealth. He showed that diseases are not spiraling out of control. None who which is to say that things are perfect or that our progress is permanent. But the world is far more perfect than it used to be. “This disconnect between perception and reality was noted by sociologist Barry Glassner …. He explored the growing distance between the things we fear and the reality of those threats. Throughout the 1990s, people became more afraid of crime, even as crime rates were falling. Other threats, such as road rage and child abduction, proved wildly overblown, while others – the satanic cult scare and Y2K, for instance – turned out to the entirely fictional. “…The stories we tell ourselves matter, and what we see around us often says more about our inner world than our outer one. All lives have positive and negative things that happen in them. But it’s about how you take time and draw connections. “Stories are contagious, and negative stories even more so. But it matters for other reasons too. One reason is that a negative outlook doesn’t let us acknowledge the accomplishments of those who are doing good work: people fighting to eliminate polio, or end child marriages, or combat global warming, or conserve our water, or educate our children. “But the most important reason is the simple fact that no problem has ever been solved by people who didn’t think it was possible to solve it. When we let the negative memes take over – when we consume them over and over online – they create a cage of despair from which we can’t see an escape. 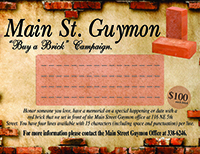 See you on the bricks … and be sure to tell me about your new story.